Oooo That Smell! Can’t You Smell That SMELL?! 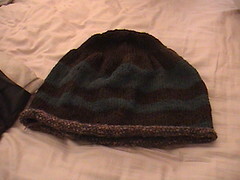 The colors are a chocolate brown and forest green of an unknown brand. 100% wool is all I know. 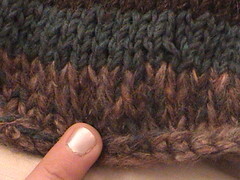 I used size 13 circs(KnitPicks) and Patons Divine leftover from Jeffs Cowardly lion costume in place of eyelash yarn on the rim. I decided that I would try felting(is it fulling or felting? I will use felting until someone corrects me.) it in the bathtub with my bare hands. I didn’t want to wait for the washer to be freed up from the 5 million loads of laundry I have yet to finish. Anyways. My point is that this stuff STINKS worse than wet dog! Now don’t get me wrong. I may not be a dog lover. I actually kinda like dogs. But WET DOG?! Makes me really appreciate my stuck up Mocha Kitty. I may get scratched up a bit when I give her a bath but at least she doesn’t smell funky. So I squeezed most of the water out. Got all of our jeans from the dirty hamper. And threw it all in the washer on Hot/Warm on the Super Heavy Wash setting. I will check it soon. I just hope my jeans don’t stink. Gotta go and spray the bathroom. The stench is not only lingering, It’s eeking around through the hallway. Catch it while I can. « What I have been doing lately.